Never sell Facebook short. 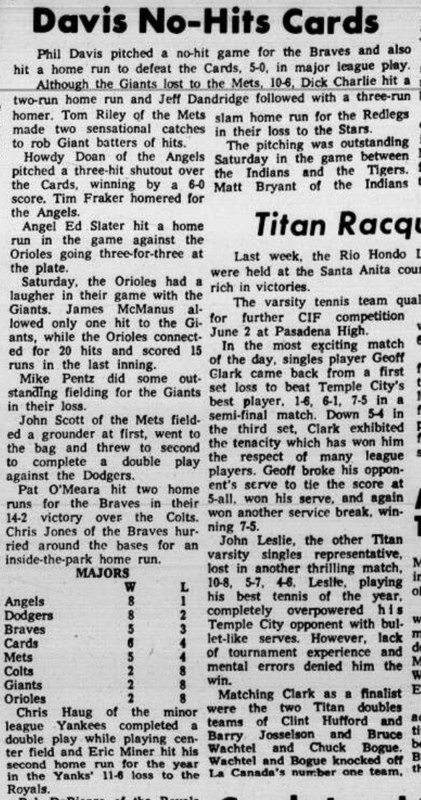 I learned this week that Tim Fraker, a teammate of mine in San Marino Little League 47 years ago, died last week. As the news spread on Facebook, those of us who hadn’t talked for decades reunited on social media. One of our Little League pals in the L.A. suburb, Jim Gott, made it to the majors as a pitcher for the Dodgers and Giants. (I hooked up with Jim when I worked at The Chronicle in the ’80s and ’90s, and we caught up). Now we are all friends again on Facebook. As it turns out, one of them, Tom Sheehy, lives nearby in Sacramento. So here’s to you Tom, Jim, Gary Driver, Jim Rellas, Bill Becker and others. Here’s an article about our team in the San Marino Tribune in 1971. As it read in in the third paragraph: “Tim Fraker homered for the Angels.” Yep, he did. I remembered that. RIP, Tim.